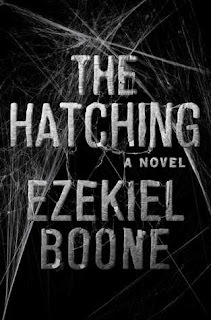 The Hatching is a debut horror novel from Ezekiel Boone. 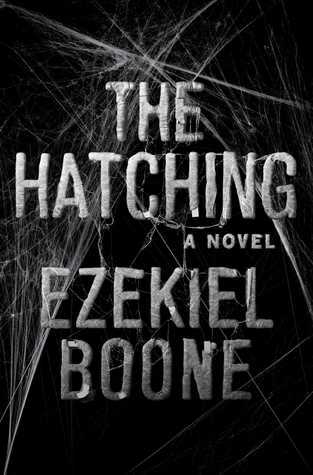 Today brings the paperback release of Ezekiel Boone's The Hatching. I thought this would be an excellent opportunity to write a catch up review of this book. I don't know about you, but I'm terrified of spiders. I can't believe I said yes to a review copy of this, but I was feeling brave and you know I love the horror books. Thankfully The Hatching handled the spiders very well. Where The Hatching really excelled was by making the story about more than just the killer spiders. There were real characters worth rooting for. If you didn't get a chance to read The Hatching last year, you still have time to discover why I'm anxiously awaiting the sequel Skitter! I used to work in a pet store that sold tarantulas. I was afraid of spiders when I started, now have no issues. Unless they are taking of the world in some fashion, I may not like that much. Nope. Nope nope nope. I'm so afraid of them I don't want to be unafraid of them. There is no amount of money you could pay me to be friendly with all of those legs. I really liked this book when I read it and have had an ARC of Skitters for what seems like forever. I'm just waiting for closer to the release date to read it. I also thought the spiders were done well. Although I have to admit, spiders don't freak me out, for me, it's snakes. Maybe that's why I can handle this book, Mogsy! I think I might be more afraid of the singular creepy crawly than the swarm. How's that for logic? No no no no no! I can't do it. I hate spiders. You are so brave! And you're going to read the sequel? I know, right?! It was well done so I'm going to try to continue the bravery! Haha. I understand. :) I'm pretty sure you could handle it. WHAT AM I SAYING? This sounds like creepy fun! Women in Horror Month: Resources!